Aliento [Breath] (1996–2002) is made up of highly polished metal disks, the surface of which has been printed using a grease photosilkscreen process. 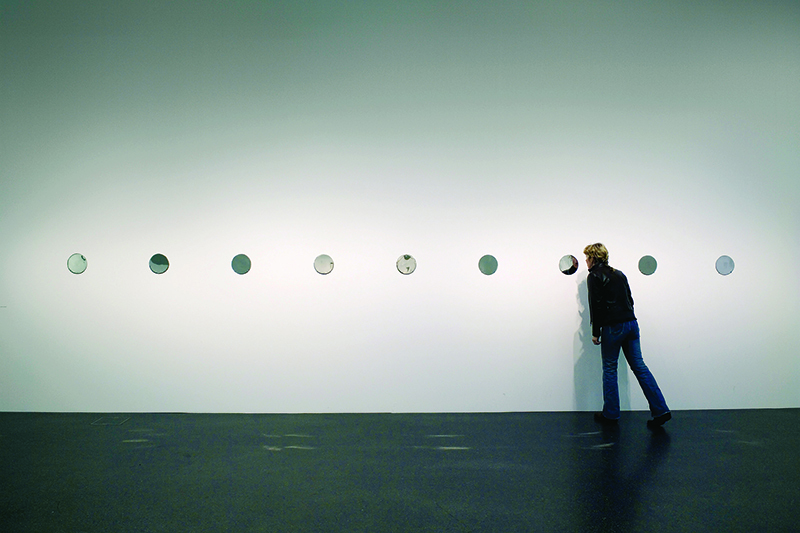 Viewers have to breathe on the surface of the disks to reveal pictures of victims of political violence. Using photographs taken out of their original context, the work acts as a visual and political metaphor exploring the theme of disappearance. Oscar Muñoz was born in 1951 in Popayán, Colombia. He lives and works in Cali, Colombia. The violence of war poses a special challenge to the art of photography, and Oscar Muñoz has met this challenge with a body of work that rejects outright denunciation. While his portraits allude to the history and political events of Colombia, they mainly call upon memory in its many metaphorical forms. He has made the photographic medium his own and combined it with artworks centred initially on drawing. In the 1990s, Muñoz began using ephemeral materials — coal dust, ink — on the mobile surface of water to create fleeting self-portraits (Narcisos, 1995–2000). His works originate in documents and their value as testimony. He has reproduced, for example, photographs from newspaper obituary columns; extracting them from the anonymous recesses of the collective past, he has lent them a physical pres- ence in installations that invite viewers to rekindle images (Aliento [Breath], 1996–2002) or to physically pass through them (Ambulatorio, 1994–95). Muñoz uses photography to alter images in ways intended to represent what came before and after them (Biografía, 2002–03). Photography’s relationship with time and its capacity to freeze motion — both specific to the medium — react as interdependent elements in the work of the artist, whose images are constantly threatened with disappearance. Since 1981, Oscar Muñoz has taken part in numerous solo exhibitions (Pori Art Museum, Finland, 2006; Prefix Institute of Contemporary Art, Toronto, 2008) and group shows (Face Value: Contemporary Video Works from Colombia, MOCA, Los Angeles, 2002; Internationales Paris/Berlin/Madrid, Jeu de Paume, Paris, 2007). He also showed at the Bogotá Biennale in 1988 and 2002. Tuesday to Thursday, 1 p.m. to 7 p.m.; Friday to Sunday, 1 p.m. to 5 p.m.
> Opening Saturday, Sept. 12, 2009 at 3:30 p.m.